When it comes to dining, an ongoing joke among my friends and colleagues is whether or not I’ve been banned from a particular restaurant. I have been banned from two restaurants in the past, and a third restaurant produced a YouTube video with the sole purpose of ridiculing me. All because of my Yelp reviews. I’ve told the story so many times I might as well tell it again, though I’m leaving out some of the specifics to protect the innocent. The story goes back four years, when I wrote a Yelp review about a midtown restaurant that will remain nameless. I didn’t think the review was particularly scathing. I even complimented their kale salad, which was hands down one of the best kale salads I’ve ever eaten. But I whined a lot, too, about the heat and noise and overall quality of their steak, which tasted as if it had been boiled. I’d forgotten all about the Yelp review when, a full year later while aimlessly clicking through my Yelp app while in line at Baker’s, I noticed a tag that said I had an unread message. I didn’t even know Yelp had a messaging system. So I tapped, and like an undiscovered easter egg found under a rock in late July, I opened the email to discover that the owners of that hot, noisy, bad-steak-cooking restaurant had read my Yelp review. And they weren’t happy. I’d like to say that the message had effectively scared me away, but in truth, returning to either of the restaurants never crossed my mind. On the other hand, their email has never failed to generate whoops of laughter whenever I pass it around the table while dining with friends. A few months later I got another message out of the blue, this time from a tipster letting me know I was about to become “online famous” for yet another of my Yelp reviews. Someone had made a satirical YouTube video of a chef reading a portion of my review of downtown eatery Block 16. It was a melodramatic reenactment of my whining about the restaurant not serving barbecue sauce with its pulled pork sandwich. I later found out my video was merely one in a series where restaurants struck back at Yelpers. Will Simons, who works for Yelp as Omaha’s community manager, said the harsh responses like the ones I’ve received from restaurant owners are rare. “Small business owners are passionate about their businesses and aren’t expecting to be critiqued on sites like Yelp,” he said. In fairness, Block 16 and the aforementioned unnamed restaurant are among the most positively reviewed Omaha restaurants in the Yelper-verse, which only goes to show I was never cut out to be a food critic. But back to Will. I was surprised Yelp had field employees, let alone someone based in Omaha. Simons, a writer and co-founder of the omahype.com arts and entertainment website as well as a member of rock bands Thunder Power and The Davs, said he got the job two and a half years ago after seeing it listed online. 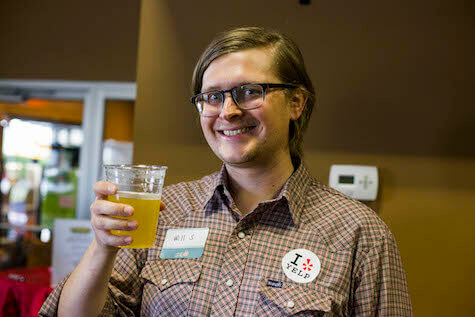 As a Yelp community leader, his mission is to interact — both online and off — with Yelp users, nurturing the Yelp community via messaging and by hosting Yelp events, like last week’s party at new Italian restaurant Via Farina in the Old Market. Simons said since he began working for them, Yelp has grown in Omaha and nationwide, with more than 167 million total monthly users of their website and phone app, and more than 102 million posted Yelp reviews. Most people think of Yelp only for restaurant reviews, but, in fact, “shopping” is the top reviewed category, followed by restaurants, and home and local services. And now there’s a new category of Yelper — the Yelp Elite Squad. “Members of this exclusive, in-the-know crew reveal hot spots for fellow locals and are the true heart of the Yelp community, both on and offline,” says the website. Simons says Elites are chosen by Yelp staff from nominees based on activity and content quality— not just anyone can be an Elite Squad member. As for negative reviews, Simons says they’re just part of the deal. “There’s nothing wrong with someone sharing their experiences,” he said. His advice to restaurant owners burned by a negative review is to not ban the Yelper, but rather reach out and ask him or her try their restaurant again. Everyone deserves a second chance, even a loudmouth like me.